← Rough winter. No worries, it’s all green! Don't worry, they're not alive! My dad and brother started keeping bees in our backyard when I was about 14 years old. 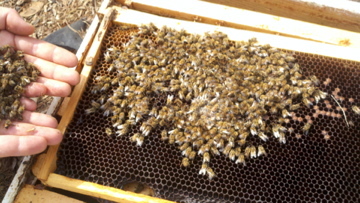 Beehives and the associated tending were not high on my priority list at the time. The bees were mainly a source of entertainment to me at that age — not of the “oh that’s so cool” kind, but of the “Oh Hey! Check it out — I think the bees are chasing Dad!” Oh teen humor. Well, my dad and brother are still keeping bees in their respective back yards, 20 some-odd years later. Today my brother suggested it’s high time for me to have my own hive. He has a couple hives in his backyard, about a half-mile from downtown Asheville, said he could help me get set up and even offered to do the tending. Wow! Anyway, through the years I’ve always noticed that to my brother, father, and beekeeper friends, the bees are not just a mass of stinging insects that happen to produce one of the most divine substances ever, but they’re also something else to them, I can’t quite place it. They love bees, their tenacity and amazing productivity despite being robbed occasionally by humans of their hard-earned honey. They are indeed amazing creatures. Today my brother brought the remnants of a failed hive to my house. 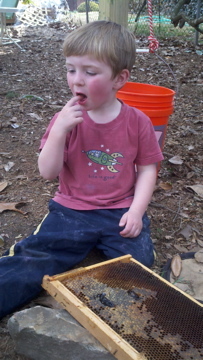 He wanted to put the dead bees in my compost pile. He wasn’t sure what was their ultimate demise, but he was definitely somber and a little quiet about it. It was almost funereal as he unloaded the white square box containing the hives from his truck, pulled out the racks and held handfuls of the dead creatures in his hands. 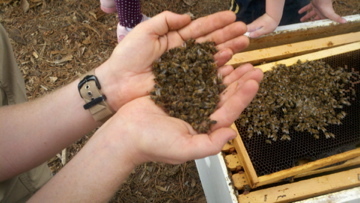 He looked at them as he held them in his hands and said “they were really good workers…..”. I sensed that he was feeling some guilt, like he could have saved them. My almost-4 year old and our almost-5 year old neighbor were intrigued. 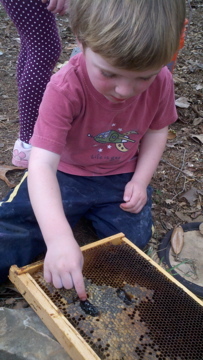 My son picked up a few of the light, fuzzy little bees and checked them out. The neighbor girl was wary, not sure if they were indeed incapable of stinging, so she observed. Intently. 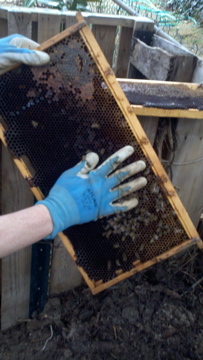 Next we took the hive to the compost pile and started shaking the bees off the racks. I swear, I felt like it was a burial. My brother kept saying that dead bees in compost were really good fertilizer, but I wonder if he was also thinking that they were going to continue working, feeding the dirt as they faded away. A proper burial of sorts. At least I was thinking that. 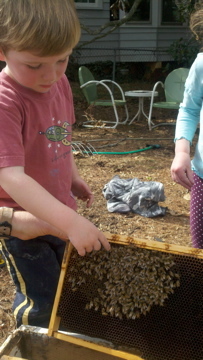 Busy bees, working on into their apiarian afterlives via the compost pile. Then the party started. I found a small area of honeycomb, still full of honey. It was some of the best honey I’ve ever tasted. My son dug right in, beeswax and all. He’s got some Pooh Bear in him. Never met a PB&Honey sandwich he didn’t devour. Continuing with the celebration of the bees’ life, the neighbor girl said, “We should thank the dead bees for the honey.” Not in a sentimental way, just using good manners, reminding us why were were all gathered in the garden right then…. It’s beyond anthropomorphizing, what beekeepers do when they talk about their bees. It’s big respect for these tiny creatures who, despite being — well, insects — behave as though they know an awful lot.